The Drager CVP 5220 cooling vest is a must for any work operation that involves high temperatures. The Drager CVP 5220 cooling vest helps to absorb excess body heat and offers comfort for the wearer when working in high temperature surroundings or performing tasks that are physical enough to cause sweating. It can simply be worn underneath protective clothing such as the TeamMaster pro-ET chemical protective suit. Its cooling action is derived from 22 PCMelements (Phase Change Material) integrated into the cooling vest, whose primary content is sodium sulphate decahydrate. At temperatures below 22°C, the content of the PCM-elements is in a solid state. At a surface temperature of 28°C, the content of the PCM-elements becomes liquid through absorption of heat energy. At higher ambient temperatures, the raised body temperature of the cooling vest wearer can be reduced by approx. 3-4°C. Depending on the level of physical work and the ambient temperature, the cooling benefit for the wearer of the vest can last for up to 3 hours. An ambient temperature of lower than 22°C provokes a phase change and the contents of the PCM elements become solid again within approx. 0.5-2 hours. The CVP 5220 cooling vest can be used in a wide range of applications. It is especially ideal for use underneath gas-tight chemical protective suits such as those from the TeamMaster series, or in industrial applications, in firefighting training, shipping, mining or blast furnace works. 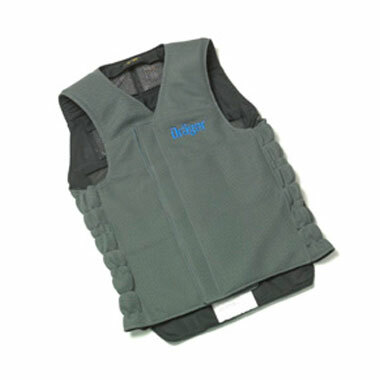 Drager CVP 5220 Cooling Vest - another quality product from Drager Safety.